Comprehensive set of optimized screening reagents and conditions that facilitate protein refolding. Rapid microplate screening using Design of Experiments (DOE)-valued approach to identify parameters that are critical to protein formulation. PROTEOSTAT® Protein refolding and aggregation sensing kit provides a concerted assay format employing a fractional factorial matrix design that facilitates screening of refolding parameters for a specific protein in different buffers, and a simple, homogenous assay format for monitoring protein aggregation using a proprietary red-emitting aggregation-sensitive molecular rotor dye. Selected samples with low fluorescence readout, thus low aggregation content, can then validated using traditional enzyme activity-based determination of refolding success. Figure 1. Refolding Lysozyme using a Redox Environment. The experiment was designed according the DOE matrix (in product insert, Table 1). In detail, 20 mg/mL lysozyme was first denatured in the 6M Guanidine solution at 4°C for 18 hours. Then, the denatured lysozyme was diluted 1: 20 into the various refolding buffers and incubated overnight at 4°C. For the PROTEOSTAT® Protein Refolding and Aggregate Sensing assay, a 1:20 dilution of the refolding solutions was added directly to PROTEOSTAT® Assay Buffer containing dye and fluorescence intensity was determined (Ex = 550 nm , Em = 610 nm). The enzymatic activity of the lysozyme in the refolding buffers was measured using 20 µg/mL Micrococcus lysodeikticus cell walls that had been excessively labeled with fluorescein, which caused dye quenching. When the lysozyme acts on this substrate, unquenched dye-labeled fragments of cell wall are released. The fluorescence intensity increase was determined (Ex/Em 490/520 nm). Native protein diluted in PROTEOSTAT® Assay Buffer was used as a reference for both the aggregation and activity assays. The refolding solutions with high aggregation signal typically had low enzymatic activity and thus should be avoided. 1A-15A: with DTT; 1B-15B: with GSH/GSSG. Figure 2. Refolding buffer 13B was determined to have a high activity and low fluorescence, as shown in Figure 1, and was selected to evaluate excipient effects on lysozyme refolding. 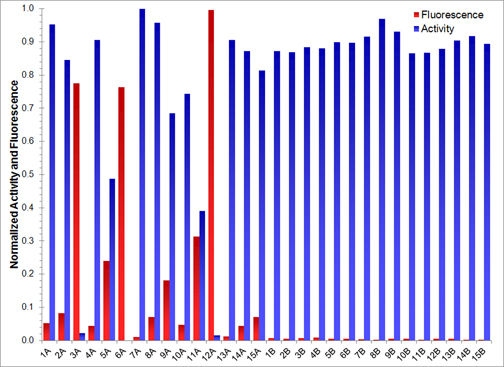 Excipients were individually added into the refolding buffer with GSH/GSSG environment, and analyzed for aggregation and activity, as in Figure 1. The results indicated that MgCl2 was the best at promoting refolding in refolding buffer 13B, with minimal tendency to aggregate. Application Notes: PROTEOSTAT® Protein refolding and aggregation sensing kit provides a fractional factorial matrix design to facilitate screening of refolding parameters for a specific protein in different buffers, and a simple, homogenous assay format for monitoring protein aggregation using a red-emitting aggregation-sensitive dye. Quality Control: Using the procedure described in the manual on page 4, denatured lysozyme is refolded as shown in figures 2 and 3 (page 11) in the manual. The relative fluorescence of lysozyme folded in each of the buffers reflects that shown in the manual, with buffers 3A, 6A and 12A showing high fluorescence, and buffers 7A, 13A, and 1B-15B showing low fluorescence. Fluorescence intensity of Lysozyme refolded in buffer 12A is at least 30-fold more intense than Lysozyme refolded in buffer 7A. 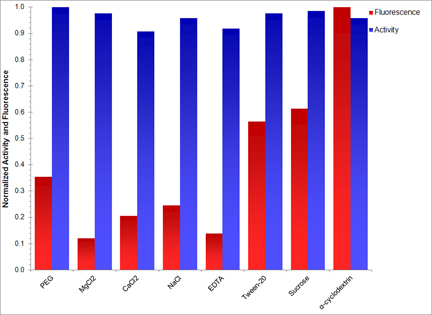 Excipients are tested in buffer 13B, with results similar to that shown in figure 3 (page 11) of the manual. Technical Info/Product Notes: The PROTEOSTAT® Protein refolding and aggregation sensing kit is a member of the PROTEOSTAT® product line, reagents and assay kits that have been extensively tested in protein aggregation applications. PROTEOSTAT® reagents and kits are optimal for demanding protein analyses involving aggregation using microscopy, flow cytometry, microplate readers and HCS/HTS, where consistency and reproducibility are required.